For nanofluids to be able to use practically, they must not cluster and precipitate. Namely, they have to become stable. The target of this study is to determine the parameters that are effective at preparing stable nanofluid and to obtain stable one.To follow nanofluid stability, its sedimentation state is determined by photo capturing and controlling continuously. It is verified by SEM images that the nanofluids, which do not precipitate and are determined as stable, are distributed homogeneously and do not constitute considerable agglomerates. The work fluid is made from Al2O3, TiO2, ZnO nanoparticles and deionized water as base fluid. The solutions are prepared with 0.1%, 0.3%, 0.5%, 0.7% and 1.0% volume concentration. They are mixed 30 minutes by probe type of ultrasonic homogenizer at environment conditions. Sodium Dodecyl Sulfate (SDS) was added to the solutions as surfactant to prevent instability occurred due to agglomeration and sedimentation. At this study, it is investigated that from where the contradictory data for stability experiments in the literature stems. Moreover, the various stable nanofluid preparation parameters that are not available in the literature are given.It is observed that Al2O3, TiO2 and ZnO nanofluids have stability up to 5 days, 7 days and 21 days without considerably sedimentation, respectively. It is ascertained that properties of nanoparticle and nanofluid preparation parameters are important to enable stability. A. Ghadimi, R. Saidur, H.S.C. Metselaar, A review of nanofluid stability properties and characterization in stationary conditions, International Journal of Heat and Mass Transfer 54 (2011) 4051–4068. W. Yu, H. Xie, A Review on Nanofluids: Preparation, Stability Mechanisms, and Applications, Hindawi Publishing Corporation Journal of Nanomaterials Volume 2012, Article ID 435873. Y. Hwang, J.-K. Lee, J.-K. Lee, Y.-M. Jeong, S. Cheong, Y.-C. Ahn, S. H. Kim, Production and dispersion stability of nanoparticles in nanofluids, Powder Technology 186 (2008) 145 – 153. S. Mukherjee, S. Paria, Preparation and Stability of Nanofluids - A Review, IOSR Journal of Mechanical and Civil Engineering (IOSR-JMCE), e-ISSN: 2278-1684, p-ISSN: 2320-334X, Volume 9, Issue 2 (Sep. - Oct. 2013), PP 63-69. M.F. Zawrah, R.M. Khattab, L.G. Girgis, H. El Daidamony, R. E. A. Aziz, Stability and electrical conductivity of water – base Al2O3 nanofluids for different applications, HBRC Journal (2015). R. Mondragon, J. E. Julia, A. Barba, J. C. Jarque, Characterization of silica–water nanofluids dispersed with an ultrasound probe: A study of their physical properties and stability, Powder Technology 224 (2012) 138–146. A. Ghadimi, I. H. Metselaar, The influence of surfactant and ultrasonic processing on improvement of stability, thermal conductivity and viscosity of titania nanofluids, Experimental Thermal and Fluid Science 51 (2013) 1–9. M. J. Pastoriza-Gallego, C. Casanova, R. Páramo, B. Barbés, J. L. Legido, and M. M. Piñeiro, A study on stability and thermophysical properties (density and viscosity) of Al2O3 in water nanofluids, Journal of Applied Physics 106, 064301 (2009). S.J. Chung, J.P. Leonard, I. Nettleship, J.K. Lee, Y. Soong, D.V. Martello, M.K. Chyu, Characterization of ZnO nanoparticle suspension in water: Effectiveness of ultrasonic dispersion, Powder Technology 194 (2009) 75–80. J. Lee, K. Han, J. Koo, A novel method to evaluate dispersion stability of nanofluids, International Journal of Heat and Mass Transfer 70 (2014) 421–429. M.M. Heyhat, F. Kowsary, A.M. Rashidi, M.H. Momenpour, A. Amrollahi, Experimental investigation of laminar convective heat transfer and pressure drop of water-based Al2O3 nanofluids in fully developed flow regime, Experimental Thermal and Fluid Science 44 (2013) 483–489. N. A. C. Sidik, H.A. Mohammed, O. A. Alawi, S. Samion, A review on preparation methods and challenges of nanofluids, International Communications in Heat and Mass Transfer 54 (2014) 115– 125. S. Z. Heris, M. N. Esfahany, S.Gh. Etemad, Experimental investigation of convective heat transfer of Al2O3/water nanofluid in circular tube, International Journal of Heat and Fluid Flow 28 (2007) 203–210. B.A. Bhanvase, M.R. Sarode, L.A. Putterwar, Abdullah K.A., M.P. Deosarkar, S.H. Sonawane, Intensification of convective heat transfer in water/ethylene glycol based nanofluids containing TiO2 nanoparticles, Chemical Engineering and Processing 82 (2014) 123–131. J. Philip, P.D. Shima, Thermal properties of nanofluids, Advances in Colloid and Interface Science 183–184 (2012) 30–45. S. Kakaç, A. Pramuanjaroenkij, Review of convective heat transfer enhancement with nanofluids, International Journal of Heat and Mass Transfer 52 (2009) 3187–3196. A. Turgut, Investigation of Thermophysical Properties of Nanofluids, Dokuz Eylül University, Graduate School of Natural and Applied Sciences, PhD Thesis, 2010. E.F. Dilek, Nanoakışkanların hazırlanması ve ısıl iletkenliklerinin belirlenmesi (Preparation of nanofluids and determination of thermal conductivities of nanofluids), MS Thesis, Graduate School of Natural and Applied Sciences, Atatürk University, 2008. M. Naraki, S.M. Peyghambarzadeh, S.H. Hashemabadi, Y. Vermahmoudi, Parametric study of overall heat transfer coefficient of CuO/water nanofluids in a car radiator, International Journal of Thermal Sciences 66 (2013). H. M. Ali, H. Ali, H. Liaquat, H. T. B. Maqsood, M. A. Nadir, Experimental investigation of convective heat transfer augmentation for car radiator using Zn-water nanofluids, Energy 84 (2015). Wang X.-J., Li H., Li X.-F., Wang Z.-F., Lin F., Stability of TiO2 and Al2O3 Nanofluids, Chin. Phys. Lett. Vol. 28, No. 8 (2011) 086601. G. Xia, H. Jiang, R. Liu, Y. Zhai, Effects of surfactant on the stability and thermal conductivity of Al2O3/de-ionized water nanofluids, International Journal of Thermal Sciences 84 (2014) 118-124. M. Karimzadehkhouei, S. E. Yalçın, K. Şendur, M. P. Mengüç, A. Koşar, Pressure drop and heat transfer characteristics of nanofluids in horizontal microtubes under thermally developing flow conditions, Experimental Thermal and Fluid Science 67 (2015) 37–47. ISNAD TOPUZ, Adnan . "Preparation and Stability Analysis of Water Based Al2O3, TiO2 and ZnO Nanofluids". 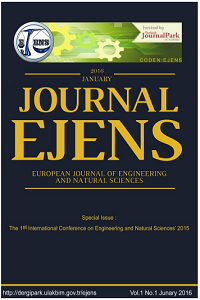 European Journal of Engineering and Natural Sciences 2 / 1 (February 2017): 70-78.